We know the Red Cross SEPA Chapter helps people in disasters, emergencies, and crises and in severe thunderstorms, fires and property catastrophes throughout all seasons from the cold winter months to the hot summer days. Many times whole families are tragically displaced from their homes during a disaster and the Red Cross commonly seeks to find them shelter and assist them with a short term and long term plan for recovery. But what happens if the disaster victims have pets? What is their fate? Are they unfortunately left behind? Do recovery services extend to the pets of survivors? That’s what the Red Paw Emergency Relief Team has been working on for a year now. 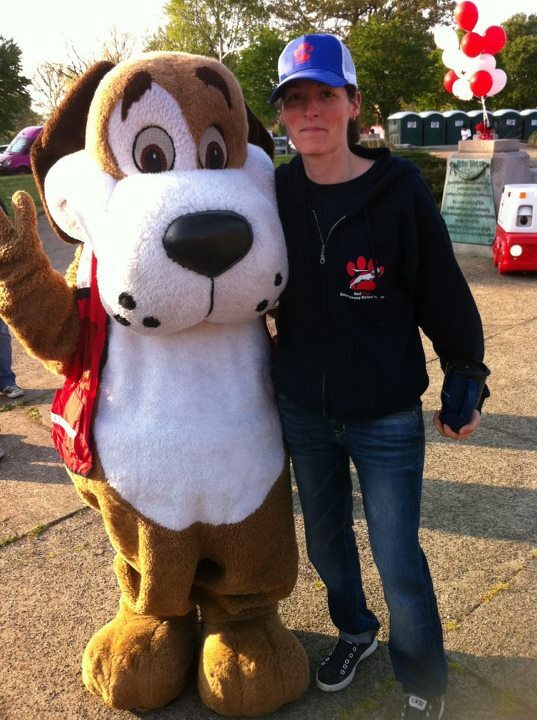 With the help of a dedicated Red Cross volunteer, Jen Leary (pictured), who championed the idea of supporting the pets of disaster victims, the Red Paw Emergency Relief Team was designed. The Red Paw Emergency Relief Team works in conjunction with the American Red Cross SEPA Chapter and partners with them at an emergency disaster scene. As soon as a Red Cross responder finds that there is an animal companion of a survivor at the scene of a disaster, Red Paw Emergency Team responders are alerted and spring into action to meet the needs of the beloved animal and to transport them to the appropriate facility. The Red Paw Team is an emergency response and animal welfare nonprofit that supports the Philadelphia, Bucks, Chester, Montgomery, and Delaware Counties. Displaced pets are cared for and kept up to 30 days, until family members are able to take them back. Family members are not charged for this care, instead all basic pet care due to a disaster is free of charge. 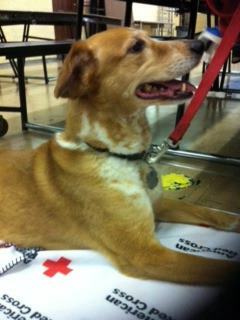 Red Paw is able to make this happen through the generous support of donations. To find out more about Red Paw, Click here. In today’s technology-savvy age, our generation has become accustomed to having access to breaking news as soon as it happens. We no longer have to wait to find out information when a disaster strikes from traditional media outlets such as local television news shows and newspapers. Rather, through various social media outlets, we are fortunate enough to know the who, what, when, where, why, and how within minutes after a disaster strikes. It is almost impossible not to know when an emergency situation has occurred given that most of us are already glued to our smartphones on a daily basis. 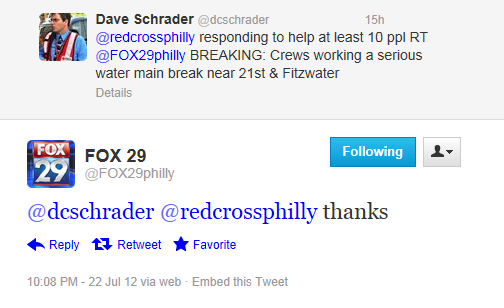 Just last night, our Red Cross SEPA Chapter communications team used Twitter to inform the public and local media outlets of our response to a serious water main break at 21st & Fitzwater in South Philadelphia. SEPA Chapter staff and volunteers set up a reception center at Stanton School at 17th & Christian for those displaced by the water main break. Four displaced families and their pets took advantage of this reception center. Over the course of the hours of our response, which went from about 11pm until 4am, Twitter served as a great communications tool between our communicators and reporters on-scene as well as media outlets’ assignment desks. It allowed us to update information about our response in real-time, and gave access to the local media to report these updates just as quickly. In fact, the social media outlet really came through for us in this particular situation in that we were able to secure an interview with local news stations, by coordinating the interview over Twitter (see photo). NBC 10’s reporter Marisa Brahney tweeted Sara Smith, our communications specialist who was on location at the reception center, to find out where Red Cross was offering assistance and how to meet for an interview. Sara, in turn tweeted Marisa back and was able to arrange a meeting spot for an interview. Th is interview then aired within a couple hours of the meeting. In this instance, Twitter was a great help in networking with the media and keeping them updated regarding our whereabouts. Earlier, twitter helped set up another interview between another of our team members and 6ABC’s Kenneth Moton. 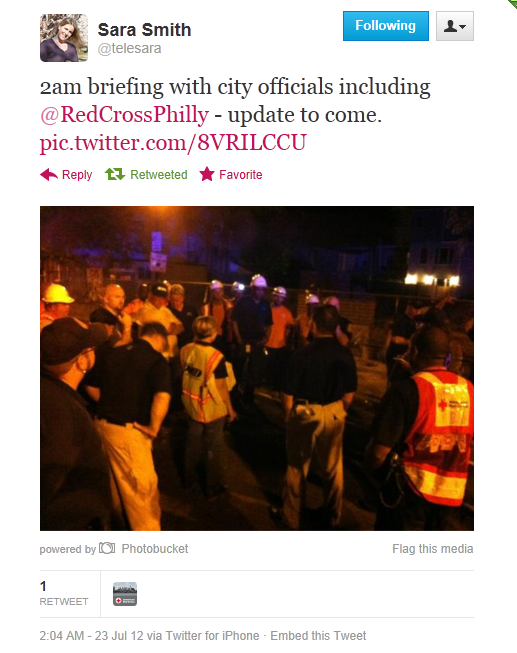 When one of our team members replaced another one, @RedCrossPhilly used twitter to notify its followers and the media of the change so they knew who to follow for reliable information. This situation is a perfect example of why I view Twitter as a very effective value chain. The local media news stations’ followers, as well as Red Cross’ followers, were able to stay informed in the moment via Twitter. In turn, those two groups of followers “re-tweeted” about our efforts to their followers, enabling even more people to receive up-to-the-moment updates about the water main break and response efforts. Last week I got a chance to visit the Red Cross House at 40th and Powelton Avenue in University City. As a new volunteer member in the Communications Department with Red Cross Southeastern Pennsylvania, I was referred to the Red Cross House for a visit to become familiar with some of the services the Red Cross offers disaster survivors in Philadelphia. A few of the things I instantly noticed when I arrived at the Red Cross House was that the facility was clean, the front desk staff was friendly, and the building supported a cool climate, which seemed requisite for a July day, and a welcome reprieve from the temperatures outside. After explaining the nature of my visit to the staff at the front desk, names were shared between us, handshakes were exchanged and then I was taken for a tour of the Red Cross House. The Red Cross House, I learned is a solution to disaster, a one-of-a-kind facility, where temporary stay and support is offered to victims of housing displacement and disasters ranging from house fires, chemical leaks, power outages and other forms of property damage. Inside the Red Cross House, beyond the front desk one can find a kitchen and dining room area where people are fed three meals a day. There are also computers available for temporary residents to use to plug into a search engine. There is a modest sized library for browsing through books and a room for listening to music. There is a laundry and storage room in the basement. Upstairs are bedrooms and even a play space allocated for children. Within 24 hours, a caseworker meets with the newly arrived disaster victims and family to map out short and long-term disaster recovery plans. 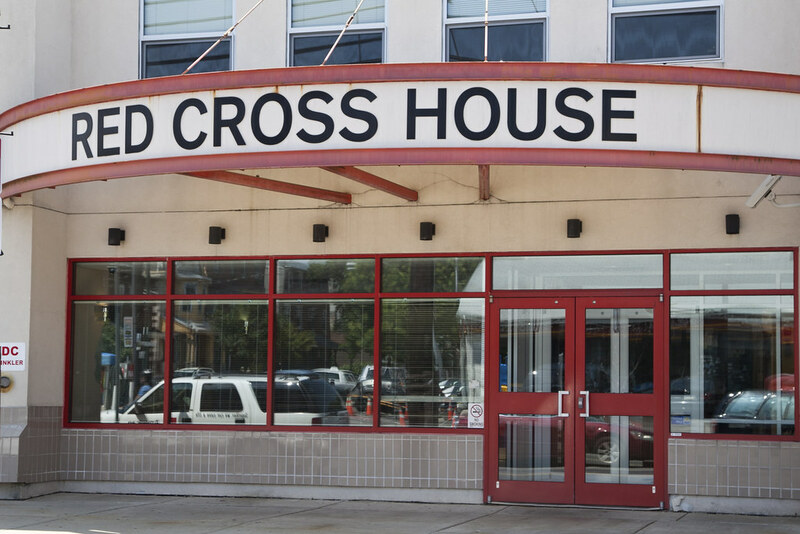 In addition to case worker services the Red Cross House offers safety training, mental health services, life skills information and housing search assistance. All of these services are provided for individuals and families staying at the Red Cross House to strengthen them during a hard time, to provide consolation, and to advocate for them in their time of rebuilding back to a place of normalcy. The Red Cross House is just another way the Red Cross is ready to help those confronted with disaster. Click here for more information about Red Cross House and its services. Danelle Stoppel, a Red Cross volunteer with the SEPA chapter, is very experienced with the transition from volunteering at the local level to the national level and understands the ongoing problems that come with traveling through areas devastated by fire. This blog was compiled from a series of text messages sent by Danelle from her recent posting in Colorado Springs. (Below are the second set of compiled texts. To see the first set, click here. Our ERV came upon people who requested our help. In an area with no reported losses, an elderly couple entered their home to find it completely destroyed by fire and now water damage from the rains. We helped them with valuables and medicine. The roof was leaking and the Sheetrock was falling. We helped them grab what they wanted to save, including an antique painting from Poland, and left the house. The mayor’s wife and a community leader who is also a roofer mobilized his crew to cover the house since we are now under a flood watch. Thank God for my Disaster Action Team training on difficult responses, which trained me to look up first and think safety. My boots did the job again. Please people, no sneakers on DAT! Motto for the day: Red Cross boots on the ground! Yesterday the new manager arrived. Her name is Janet and she is from Florida. I quickly briefed her of the events and activities of the past eight days. She arrived with a supervisor named Sharon, also from Florida. They have worked together on other disaster responses. Janet and Sharon set up their operation and I stepped aside so they could assume command. My crew of great young people including Karin, Lisa, Michael, Luanna, Walt, Don, Carol, and Ruth are now part of a larger group of thirty people. 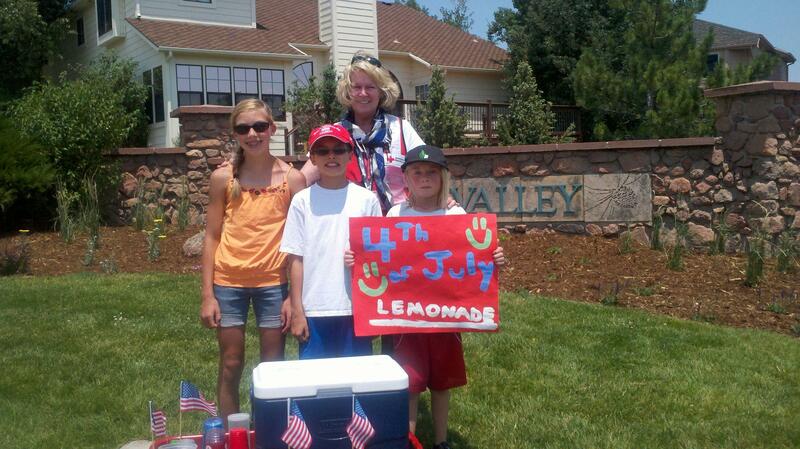 I will see them tonight at a local party sponsored by Colorado Springs to honor the American Red Cross. I am currently riding on an ERV to deliver services to residents who are seeing their homes for the first time. I leave tomorrow for home and I know my chapter is busy with a large fire and the aftermath of strong storms. I promised American Red Cross of Southeastern Pennsylvania chapter pins to many people since it is considered a real find. Hopefully, my energetic approach to delivering mental health services has been effective during the first phase of this disaster response. Mental health was the first service to arrive in Colorado Springs. See you soon. I received a letter from my youngest son yesterday. He is away at summer camp and loving every minute of it. His letters are full of great stuff like – “a ball hit me right in the face really hard but then it dropped into my arms so the guy was out and it was okay.” Or this wonder-goodie, “I’m working on some back flips off the high diving board into the lake but I keep missing!” Missing what? The diving board itself? The water? 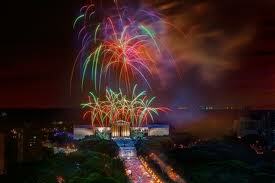 My favorite was the report on preparations for July 4th. “The Bridgers (Counselors in Training) are building the wood pile for the bonfire in the meadow. It’s super high and the flames will be really intense!” Really? A huge bonfire in near a wooded area containing several hundred children between the ages of 7 and 17? It’s July 4th people! That’s the kind of crazy stuff we get up to celebrate the birth of our nation. So today, July 3rd, is a good day to do some thinking and some planning before we welcome our friends and get out the barbeque. 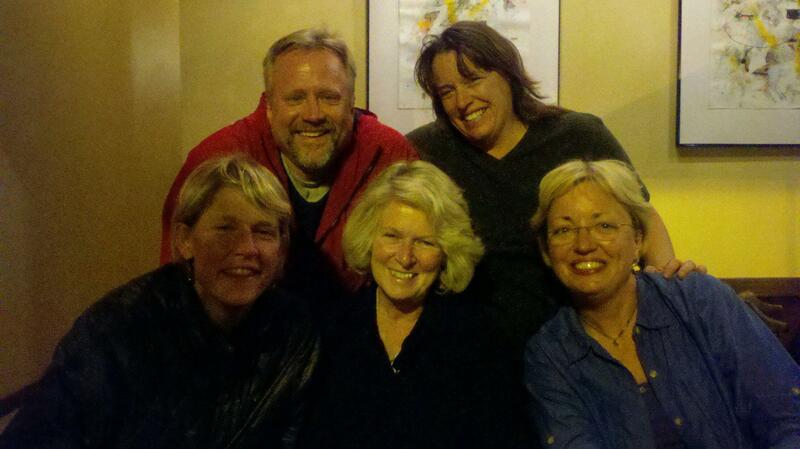 Friends of mine drive from Philadelphia to South Carolina for a large family gathering at this time every summer. One year, a chaotic evening with small children delayed their journey and left them low on gas and unprepared for terrible traffic. They had forgotten to fill water bottles and pack snacks for the car and spent a very stressful few hours getting out of the northeast corridor madness. Needless to say, they learned to value of planning ahead. The length of their journey has them driving quite late at night. They plan their route carefully and switch drivers at their frequent rest stops. July 4th will be the start, for many of us, of an extended outdoor weekend. I will tell you from personal experience that while there are many fabulous ways to spend this great holiday, sitting in the emergency room with an active and energetic child is not one of them. Again, it helps to make expectations clear at the start of any gathering. I you are celebrating by a pool, check out these important guidelines for pool safety. Make children aware of dangers if they are in unfamiliar surroundings. Tell them that swinging on the swing set is fine, but walking on top of it as if on a balance beam 12 feet from the ground is not a wise choice. This may seem obvious to some but not to many 8-12 yr. old boys I know. Explain that while football is a great American game, the tackle variety is not an appropriate option when playing with your five year old cousins. Keep a first aid kit at hand for skinned knees and other abrasions, and keep all youthful enthusiasm away from the grill. If it can char your hamburgers, it can really harm a child. Speaking of that grill, use it wisely! If your charcoal briquettes have been sitting out on the damp part of the porch, spring for some new ones that will light up nicely with safe fuel. If it’s raining – and the possibility is in the forecast – don’t move your grill onto the porch or into the garage. Don’t grill! The kitchen has several heating elements that will cook your food safely and efficiently. I recommend checking out the American Red Cross tips for a safe July 4th. It’s informative reading. Most of all have a wonderful and safe holiday. Warm summer evenings with friends and family are a precious gift. The American Red Cross urges you to protect everyone you love with some careful planning.